Ventilation at home. 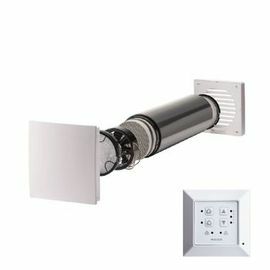 Ventilation system in a private house on the basis of supply and exhaust systems. The process of implementation of ventilation system in a house represents a set of measures aimed at organization of the proper air exchange in each room, which, in its turn, creates a favorable microclimate. Air exchange is the outflow of exhaust air from rooms and the inflow of atmospheric, but purified air. Why ventilation in a private house is considered a necessity? Let’s imagine an ideal house. Tell me, please, can the concept of an ideal house be connected with an unfavorable microclimate? Under the unfavorable microclimate, I mean the air that, due to stagnation, becomes uncomfortable for a person. This leads to the fact that we feel fatigue, have a headache, poor working capacity and well-being. Don’t forget to complement this picture with the fungus and mold on the walls of the bathroom, which arises due to high humidity. It is unlikely that such conditions are correspondent to the concept of «ideal home». To avoid this, it is necessary to organize the correct ventilation system, which consists of two processes: the discharge of used air to the outside and the inflow of clean, atmospheric air into the house. Separately these processes will not give you a desirable result, what we aim at here – is the right balance between the supply and exhaust air. The interaction and proportionality of these processes are highly important. With the help of these two processes residents feel better and healthier, moreover, durability of the house also increases, because ventilation helps to keep building materials in good condition from the inside. What kind of ventilation services can I offer you? The entire process of development of the ventilation system in the house consists of several stages. Start of work lies in personal dialogue with the customer and exchange of all necessary information: the total area, number of residents and individual wishes of the client. We choose the best variant of the work concept, as well as the further strategy. On the basis of all received data, we develop a technical commercial offer. This document constitutes a set of engineering solutions in figures: the quantity of goods, its abbreviation and nomenclature; the number of additional elements and tin; full cost of all necessary equipment, components and the installation itself. It allows us to discuss what each item is responsible for and its significance. Thus, with a commercial offeron hands, a person will be able to understand what financial equivalent will be involved in the design and installation of the ventilation system in the house and will be able to assess their capabilities. If the customer does not agree with the final cost, we will take into account exactly that equipment, which will be more affordable if it does not contradict the requirements of our company about the expediency of the system. It is important to know! Like every work, the development of a technical commercial offer is paid. Its cost depends on the characteristics of the house, its overall area and the personal wishes of the customer. How to choose the right equipment for ventilation? Only reliable and well-known manufacturers can provide high-quality materials. As far as I am the official dealer of such plants, I will give you a choice among the top manufacturers of climate technology: Maico (Germany), Systemair (Sweden), etc. Before choosing a specific model, we offer you to calculate the necessary amount of air, in each section of your house. The capacity of the installation is calculated depending on the number of residents or on the required multiplicity of air change in the room. Multiplicity of air change is a figure that means how many times, within one hour, the air in the room will be completely renewed. Supply and exhaust systems have small dimensions and most often they are installed in technical rooms. 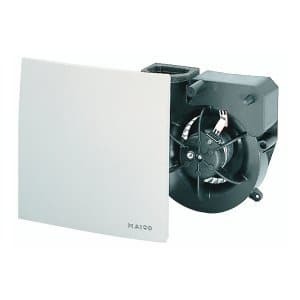 Next advantage is a silent operation (for example, the German unit Maico WS 320 has a noise level of only 36 dBa), so it allows you to install the unit even near living rooms. All installations are equipped with filters, so you get not only fresh, but absolutely clean air. The further operation consists only in personal visual inspection and periodic maintenance service. The installation is also equipped with intelligent control, and you can configure the modes via special application on your gadget remotely. As an advantage, many supply and exhaust systems, in addition to the standard equipment, have additional elements, which are indicated in the name index: Maico WS 320 KB — equipped with a PTC preheating register and bypass, and the Maico WS 320 KBET additionally has an enthalpy heat exchanger. 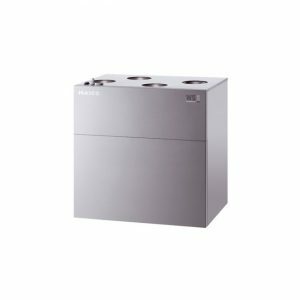 -	Highly technological equipment, which is represented as the supply and exhaust system with heat recovery. -	Symbiosis of a small supply and exhaust system and exhaust household fans. -	Implemented without air ducting. In order for the house ventilation system to work properly, first of all, it is necessary to create a project that includes engineering schemes and an architectural drafting. The specialist chooses the most constructive solutions for the object and, according to the commercial offer, designs an internal engineering system, in our case – ventilation for the house.The entire drawing is implemented on the basis of previously performed calculations and allows you to visually see the result even before the beginning of the installation work. At this stage of work, you can fix all the smallest nuances and create an ideal system for you. I’ll show you how to trace the air ducts in your house to ensure minimal resistance. This will allow you to calculate the number of tin, chokes, noise insulation material and other important elements of the ventilation system, and I will explain their purpose and importance of use. My another task is competently tell you about the automation in the ventilation system, why it is needed and what it is responsible for. I’ll tell you what is the correct air exchange and how to properly place the diffusers inside your houseto ensure the necessary air distribution in each part of it. The ideal time to start the implementation – is together with the construction of the house or in the process of its repair. The document must necessarily be agreed with the construction company and correlate with other engineering systems in your house, such as air conditioning, water and sewerage, electricity and others. An obligatory condition for the creation of the project is the coordination of the system with the construction of the building. This will allow to correctly distribute the position of the holes in the bathrooms and toilets, as well as correctly coordinate the path of the ducts. dirty zone – kitchen, bathroom and toilet (or a combined bathroom), dressing room, pantry, technical room. Such arrangement of the ventilation system will allow to minimize the loss of heat and send it from the dirty areas to the recuperator in the supply and exhaust system. Further, the heat exchanger transfers energy to the incoming air and, through ventilation ducts, it is sent to clean zones. In person, I will tell you in details what preheating and air cooling are and how the recuperator handles this task. I will describe the main characteristics of the heat exchanger, its types (lamellar in Maico, series WS 320 KB or 470 KB, as well as in Systemair, SAVE VTC series and rotary in Komfovent, Domekt REGO series), efficiency indicators and explain the necessity of recuperator in the ventilation system. An important stage in the organization of supply and exhaust ventilation in a private house is the correct installation of the system. You can choose high-quality and expensive equipment, but because of non-professional installation, it will not perform the tasks that were declared by the manufacturer. The installation specialists must carry out their work, accurately referring to the tasks conceived by the engineer, combining them with their high skills and many years of experience. Only correct and professional actions at all stages of the work – from thecreation of a commercial offer to commissioning, will allow the proper implementation of an internal engineering system – general exchange ventilation with heat recovery. As a result, you get high-quality and healthy air inside each room, which conains correct amount of O₂. Thanks to this, you can improve the quality of sleep and your well-being. In addition to positive health outcomes, the recuperator provides significant savings on costs that relate to the heating and air conditioning system.